What are volunteers saying about 3R Rescue? 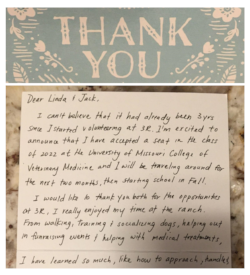 UC Davis graduate thanks 3R Rescue as she heads off to Vet School! "I can't believe it has already been 3 years since I started volunteering at 3R. I'm excited to announce that I have accepted a seat in the Class of 2022 at the University of Missouri College of Veterinary Medicine and I will be travelling around for the next two months then starting school in Fall. I would like to thank you both for the opportunities at 3R. I really enjoyed my time at the ranch. From walking, treaining, and socializing dogs, helping out at fundraising events and helping with medical treatments. I have learned so much like how to approach, handle, care for dogs, how the process of rehabilitation works and much more. All of these really showed me that it takes a lot of hard workd, patienec and love to be in this field. This is why I admire the work you both do and everyone at 3R do. You are all amazing and I'm really proud and grateful to get to be a part of the 3R family. I'm going to miss everyone and all the animals at 3R as I embark on my new journey. Hope I get to come back in the future. I wish you all the best! "